For reliable and professional results, look no further than the Panasonic UF-5300, a high volume multi-function laser fax machine designed with the needs of medium and large businesses in mind. Don’t be fooled by the compact design of this device; the machine boasts a 50-sheet document feeder and has a paper storage capacity of up to 250 sheets. The intuitive machine requires little user interface and promises to scan documents at a rate of three seconds per page. It also offers a massive 480-page document memory, perfect for when jobs exceed the capacity of the automatic document feeder and need to be transmitted in a single batch. Measuring a compact 474x370x253 mm and weighing just 9.3kg, the Panasonic UF5300 comes in a sleek and attractive design ideal for most offices and workplaces. It features a simple operation panel, with hard keys displayed in a logical sequence for the ultimate ergonomic design. The machine offers image memory capacity of 8MB (about 480 pages), recording resolution of 406 x 391 dpi and modem speeds of 33.6 kbps. The 340 station auto dialler allows frequently used fax numbers to be saved into the system with 40 one touch and 300 abbreviated buttons. 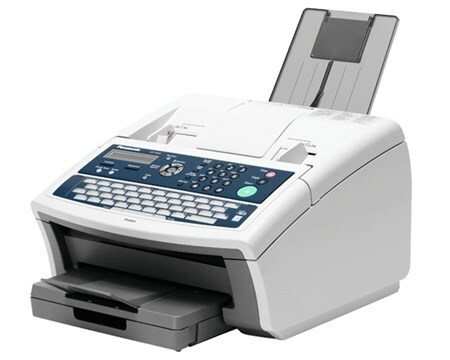 Fast and reliable, the Panasonic UF5300 is designed for large businesses dealing with high volume faxing jobs. The large document memory, 250-sheet capacity tray and 100-sheet reception tray make it perfect for complex projects. The document memory feature ensures the user can undertake multiple jobs at once without skipping a beat. The 33.6 kbps modem is also super fast and boasts a three seconds per page scan time. This high volume Panasonic UF5300 printer is targeted towards the needs of large businesses. The speed and excess features will not be required by small and medium businesses.